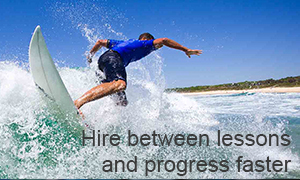 Lets go Surfing is the only officially licensed surf school at Maroubra Beach. Maroubra or ‘the bra’ is a world class surfing beach, and has less crowds than many of Sydney’s other beaches. Located just 10km from Sydney’s business district (an easy bus trip… check out the links below), come here if you’re looking for a less touristy and more local vibe, with great waves and less people around…. Maroubra is 1 Kilometre in length, making it the longest beach in the eastern suburbs, so more sand and surf to go round! In 2006 Maroubra Beach become a dedicated National Surfing Reserve, the first in New South Wales. When you come down check out the plaque located on the northern promenade, with a Surfers Walk of Fame. Maroubra is lies about 10km south-east from the centre of Sydney Business District. Maroubra gets its name from an indigenous word meaning the place of thunder. Maroubra has a number of surfing clubs. At the north of Maroubra Beach there is a saltwater swimming pool, and in the middle of the beach there is a skate park. Maroubra is home to two surf life saving clubs. The Maroubra SLSC formed in 1907 and South Maroubra SLSC formed in 1963. Maroubra Beach is regarded as one of Sydney’s best surfing destinations, as such it has been home to world class surfing competitions like the Snickers Australian Open which was won by Kelly Slater. BY CAR There is a free car park in the middle of the beach. BY BUS Catch the 376, 377, 395 or 396 from the City, Circular Quay or Railway. Click here to check out the timetables and plan your trip.